After the fairies’ magical duel, everyone flourished in Petlandia. Some say it’s still a magical place to live where Petlandiers care for pets of all kinds. 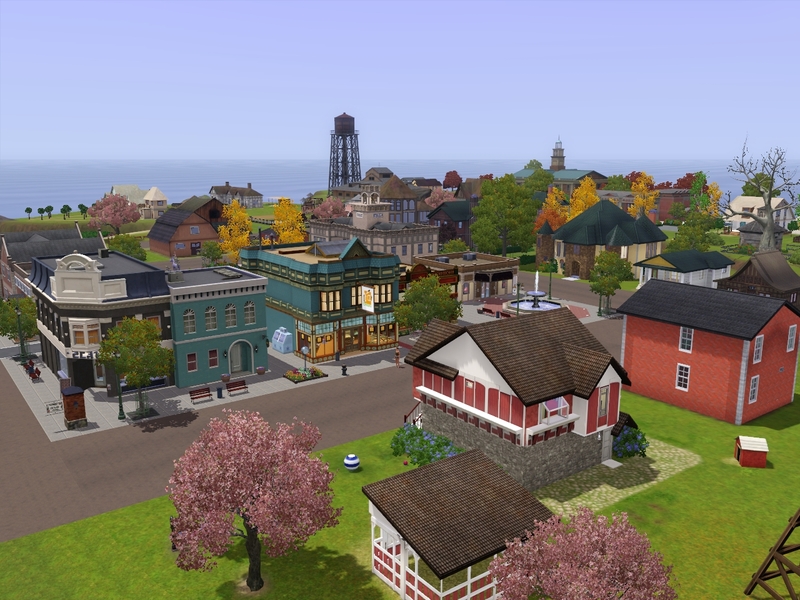 Petlandia residents built a village with homes, a school, and businesses. Talented crafters paid special attention to areas for pets and their families. Some ancient dwellings remain even today. 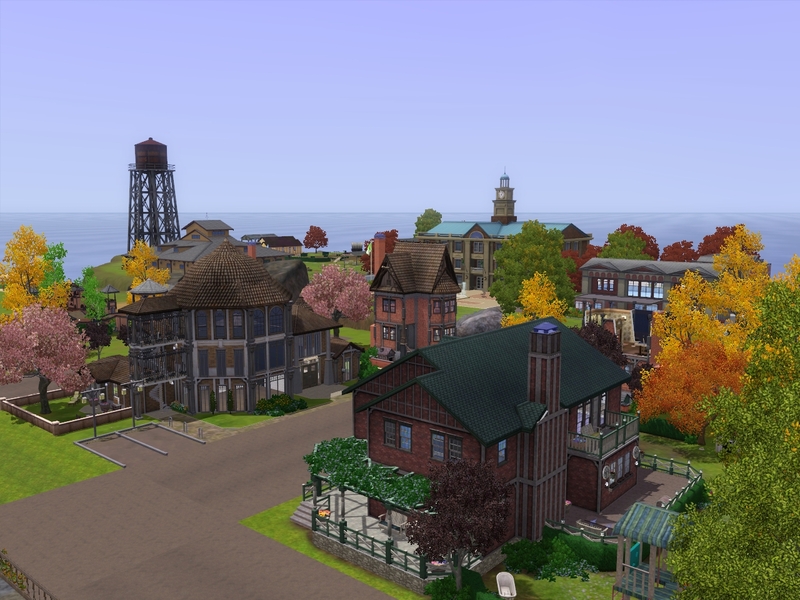 Will your sims and their pets live happily ever after in Petlandia Village? 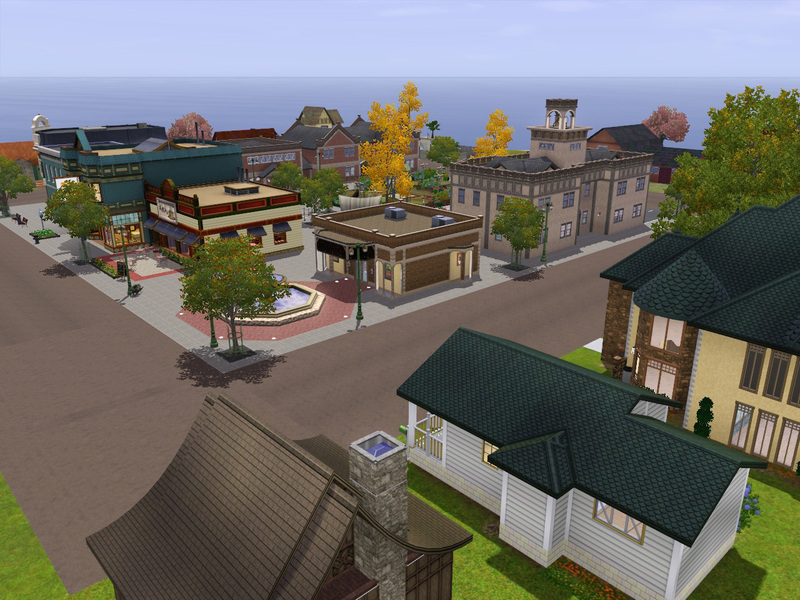 Petlandia Village is a quaint place with everything Petlandiers need - a civic center, hometown hospital and research center, shops, businesses, a village school, and plenty of family and pet friendly homes of many sizes. A number of homes are starter priced. There are even some apartments. Petlandia Village was a collaborative effort by M4BCreators. 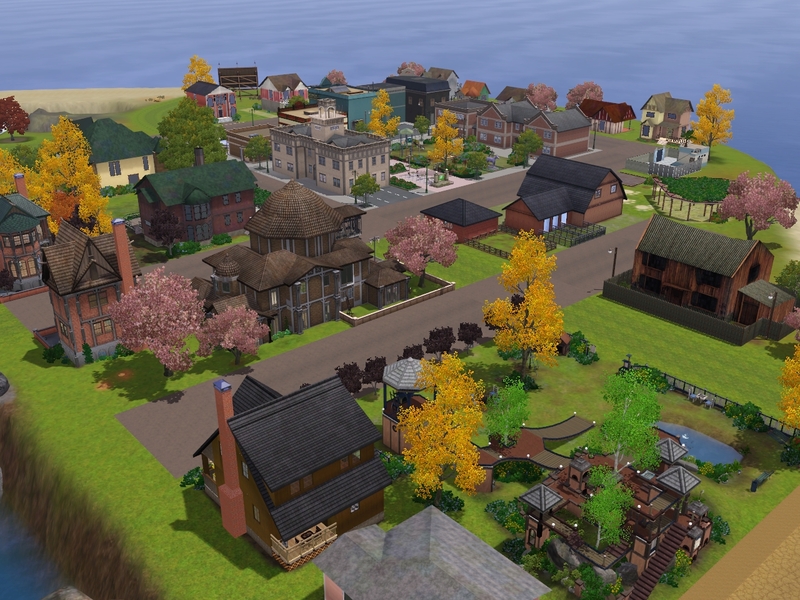 The village and lots were built with base game and Pets EP items only. It has no CC or items from other EPs or stuff packs. Many of the roads and sidewalks are "grass" to help maintain the look of the cat's and dog's "collars" and the cat's "stripes". The fishing spot is in the dog's ear and the beach is at the tip of the cat's tail. Routing should accommodate wild horses. Or, players can turn off wild horses in game options. 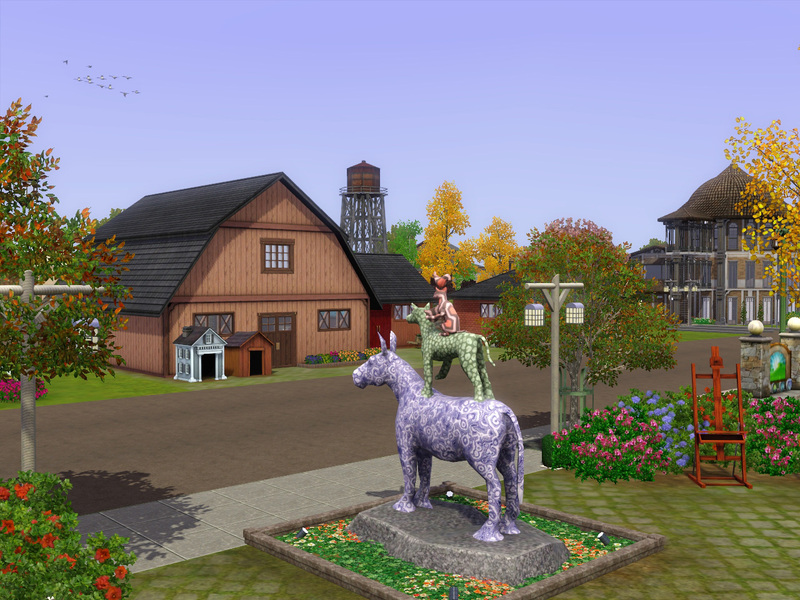 All Petlandia Village lots were built or revised by M4BCreators specifically for the village. 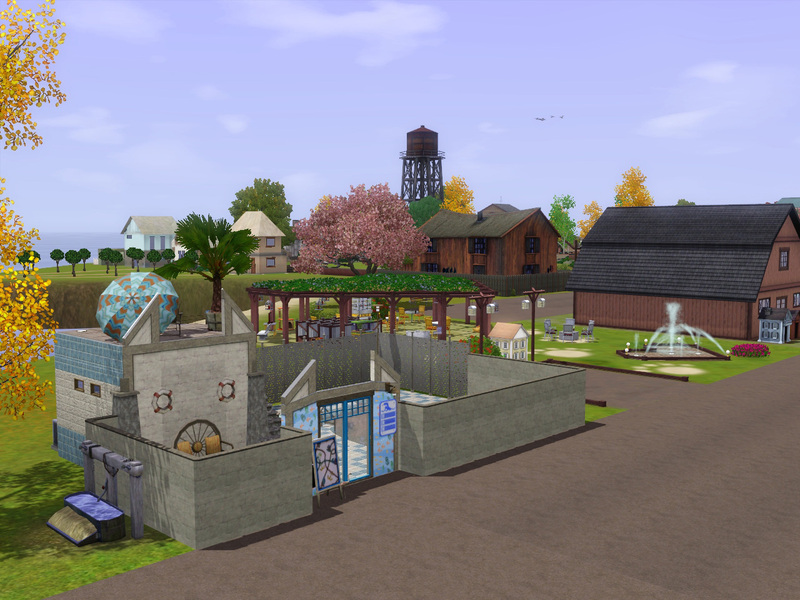 Watch for future uploads of specialty expansion pack lots built by members especially for Petlandia Village. 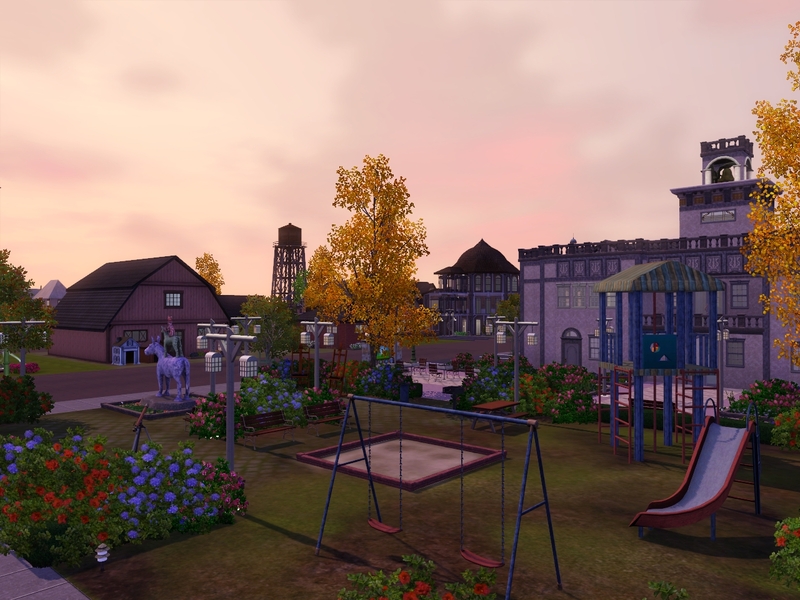 Petlandia Village is the latest group project by M4BCreators, a collection of simmers who build in TS2, TS3, and TS4. 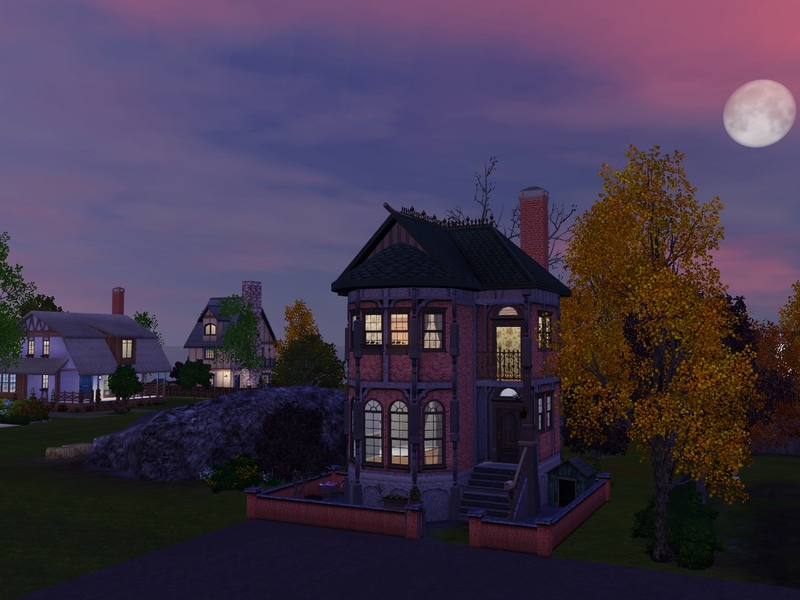 Group members include novice builders, experienced builders, and everything in between. We share WIPs, tricks and techniques, and are here to lend a helping hand or appraising eye. 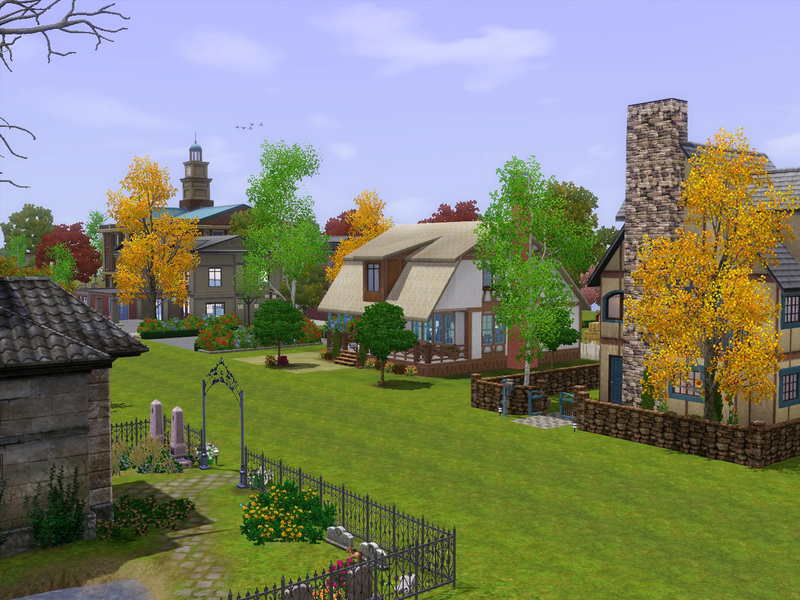 If you love to build, check out our group: http://www.modthesims.info/showthread.php?t=587151. 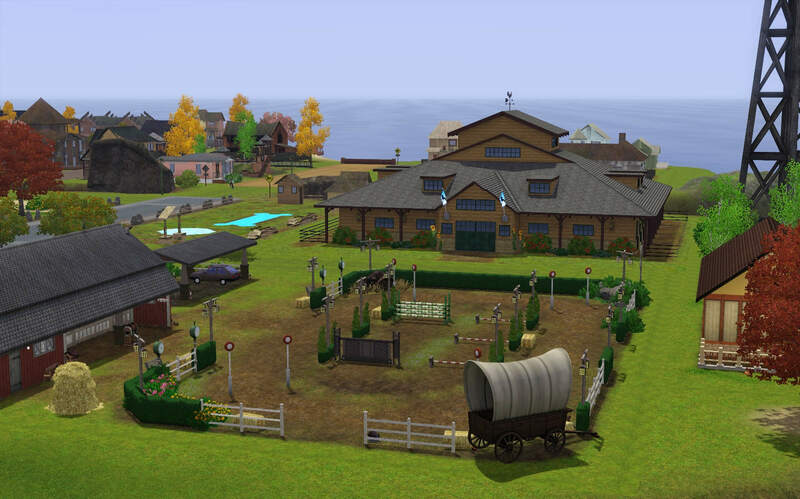 Screenshots of Petlandia Village in CAW and in game. Map Size: Medium (1024x1024) with a smallish land mass, 38.5 MB. Spawn Points on Map: Base game – Beetle, Butterfly, Gem - Epic, Meteor, Seeds; Pets -- Dog Dig Spot, Large Bird, Lizard, Rodent, Small Bird, Snake. Remaining base game and Pets spawn points are located on lots. Routing Info: Some additional sidewalks and streetlamps have been added to the Petlandia Village map. 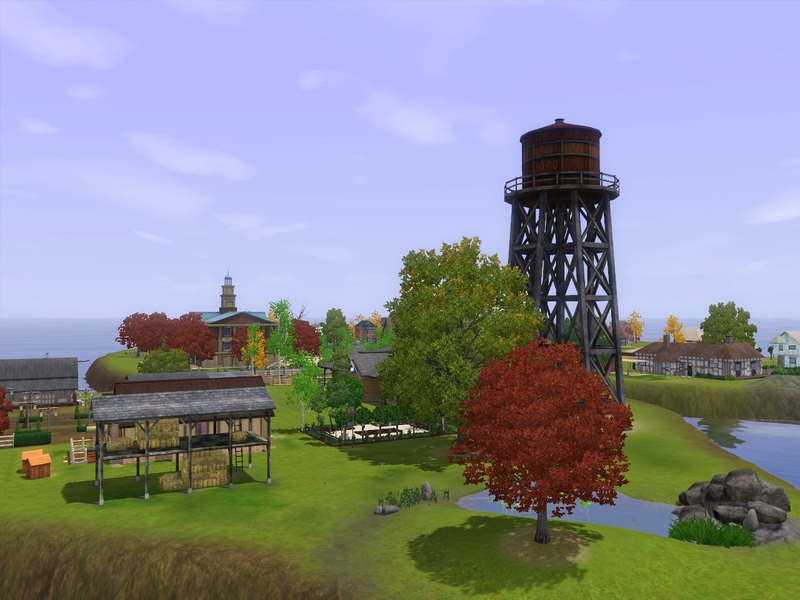 Sims cannot route up or down sides of the island or in valleys. Isolated routing "nodes" were eliminated to avoid "stuck" sims. The camera can go anywhere. There are no “hidden” spots in Petlandia Village. Textures: 16 textures total used with all being in-game textures. There are likely more than 8 textures per chunk in Petlandia Village but it does not appear to have affected performance. Petlandia Village’s Fishing Spot has fog emitter effects on the lot – waterfall and waterfall splash – so, as with all custom worlds, players will have to open the world, save the world, and then play the saved version to enjoy the effects. Petlandia Village is NOT populated. There is no Custom Content in Petlandia Village. (World checked with CUSTARD.) Care was taken to use only base game and Pets items. Petlandia Village Requirements: Only base game and Pets are required for Petlandia Village. 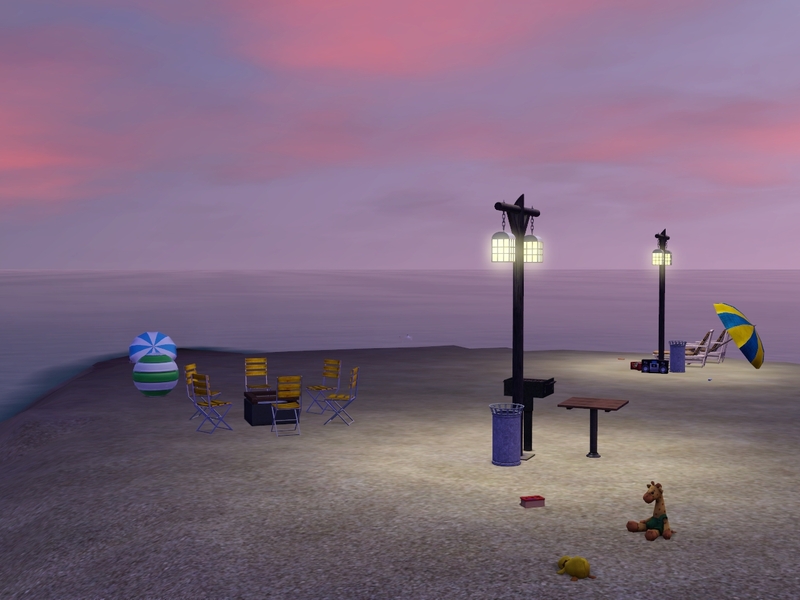 Streetlights, some décor items, and some spawners would be absent if player does not have Pets. The effect on playability is unknown. 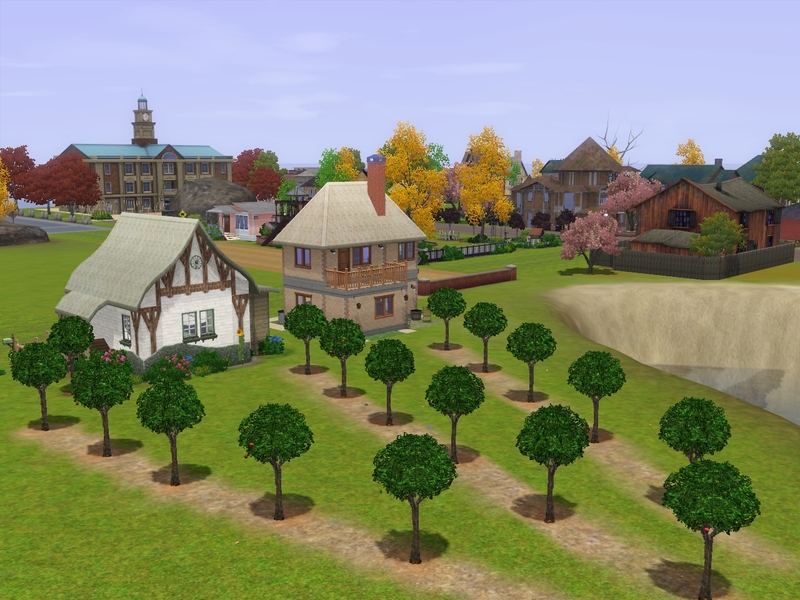 44 lots total - 24 Residential & 20 Community. A few Petlandia Village lots are accessible by sidewalk only – “Walkie’s Club” and The White Barn 10x10 lots on Dog Leg Path, the 10x20 Community lot with Pepie Park, Dog ‘n Suds Fishing Spot, and Nature’s Bounty Zen Garden and Fetch Stick below the Fishing Spot. All the Mentoring for Builders and M4BCreators members for contributing/decorating lots. Thank you so very much to SimmyRN for creating this fantastic world, and attuned and Norn for play testing, screenshots and feedback for Petlandia Village.